It seems all noxious weeds are difficult to control, but Japanese Knotweed has earned the nickname “Godzilla weed.” So it can really wreak havoc with a landscape if not controlled. 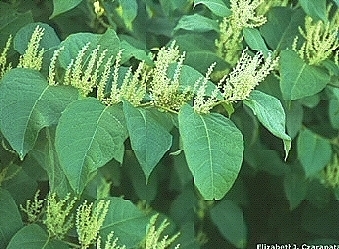 When I was a child, we used to see a vine we called Wild Cucumber (Echinocystis lobata) along roadside fencelines and trees in ditches, but today we see something called Japanese Knotweed (Fallopia japonica). It’s gotten quite a hold along the fencelines and ditches and I suspect it is because for years, we thought we were still seeing Wild Cucumber. A non-native perennial from Asia, it is classified as noxious in almost all the states. Japanese Knotweed (Fallopia japonica) in bloom. This photo was taken by Elizabeth Czarapata for her book Invasive Plants of the Upper Midwest: An Illustrated Guide to Their Identification and Control, the first comprehensive guide on invasive plants. Blooming August through September, it’s creamy white to greenish upside-down icicle-like clusters of blossoms appear near the end of stems as they creep along the crest of trees and other roadside plants. It has green spade-like leaves, which vary from heart-shaped to varigated. Its stems zig-zag and have reddish blotches. Its white roots are rhizomenous which means every little bit left behind will sprout a new plant. Although not related, Japanese knotweed has hollow stems with distinct raised nodes which give it the appearance of the evergreen perennial bamboo. Like bamboo, knotweed also sends out new shoots from these nodes, so you don’t want to compost it. The Phyllostachys species of bamboo is also classified as a noxious weed. Note: Place any knotweed debris in black plastic bags and discard in nearest landfill. Another method to try for a small area is smothering. Make sure to use heavy black tarps and cover with mulch to hold the tarps in place. This may require more than one season. Just like with most noxious weeds, the key is to not give up. You must keep at it. Because Vermont has similar terrain as Wisconsin, you might be interested in this Japanese Knotweed Fact Sheet.